How do they do that? is a new series for The Source that explores the technology that helps keep Metro running and passengers and other commuters moving. Some of it applies directly to the trains, buses and freeways and some of it runs in the background — invisible to nearly everyone but essential to mobility in our region. How does Metro transport rail cars from manufacturing sites around the world to L.A.? Metro operates five rail lines that include three light-rail lines and two heavy rail (subway) lines. Train cars running on the lines are thus far manufactured by three companies: AnsaldoBreda (made in Italy), Nippon Sharyo (made in Japan) and Siemens (made in California). Obviously, cars made in Italy and Japan can’t just be rolled here on rail. But the same is true of cars manufactured in California. Unless the cars are made adjacent to the Metro rail lines on which they will run (none are), they must be transferred via some means. Breda light-rail carbody shells are manufactured in Pistoia, Italy, with final assembly in Pittsburg, Calif. in the Bay area. 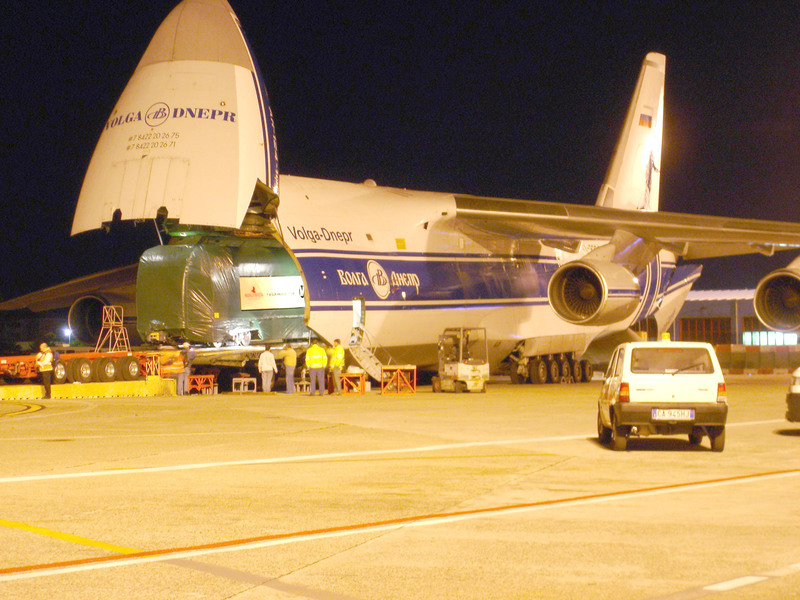 But before production could begin for the 2550 Breda rail cars for the Gold Line, a prototype was built in Italy and transported from Pisa to L.A. on a Russian-built cargo plane (see 2005 photo above). At LAX, a crew transferred the car onto a flatbed truck for delivery to the Metro Gold Line maintenance facility just north of downtown L.A. 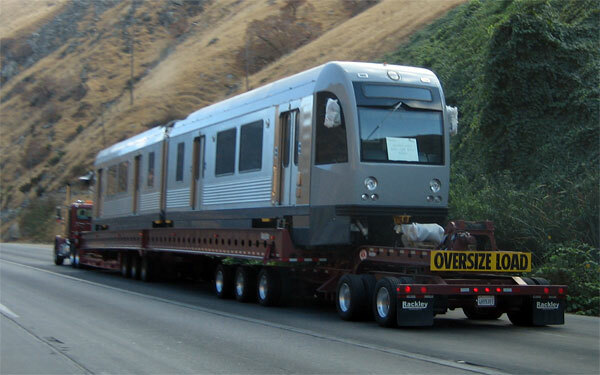 Remaining Breda cars were transported by a U.S. cargo ship from Italy to Houston, trucked to Pittsburg for assembly and then transferred by truck back to L.A.
Nippon Sharyo light-rail cars for the Metro Blue Line were manufactured and assembled in Japan and shipped — in halves — to L.A., where they were mated and reassembled. Siemens light-rail carbody shells were manufactured in Carson, shipped to Sacramento for final assembly and then trucked back to L.A.
Metro’s next rail car delivery will be of two Breda cars made in Italy. They are scheduled for delivery in early 2012. In spring, 2014, Metro expects two prototypes for an order of 78 light-rail vehicles. (The manufacturer has not yet been selected.) Watch to see where they come from, how they arrive and what lines they run on. The Expo Line, no doubt, will see more than a few. So we spend hundreds and thousands of taxpayer money to airship the trains from abroad because we have lost the manufacturing skill to produce these trains here in America. What’s wrong with just manufacturing 100% right here in Los Angeles? Oh, that’s right, our tax codes and labor union costs are too high. Is there a reason why we couldn’t scale up production at the Carson plant? So many of these transit revenue streams have “Buy America” provisions–keeping the production in California is good for jobs and good for checking the bureaucratic boxes. I’d rather see Made in California cars rather than made in Europa or asia. I thought metro was planning on building a green tech plant to make their own cars. Made in USA won’t happen until we get all the cities around the country using the same equipment which would then lower the cost to build these cars. Small batches are expensive. Need to stretch the costs out over more orders. Think a new ‘PCC’ car for the future. That was done before, but doubtful in todays political climate this will ever happen again. The pictured aircraft is however Russian owned and likely registered in Russia. 2) AnsaldoBreda did not fly their prototype to the USA just because they could; They needed to deliver the prototype car by a set deadline and had missed the window needed to send the car via ship, which is the norm for such deliveries. In order to avoid penalties and potentially lose the contract, they were forced to spend a huge amount of money to fly the car from Italy. While it made for impressive photos, it cost AnsaldoBreda a pretty penny/lira/eurocent!